“Anything that can go wrong, will go wrong”. “Anything that can go wrong, will go wrong, but it will wait until it really, really goes wrong”. It is always amazing to see that systems having a fundamental flaw, they can work for a long period. Only that on day X my application crashes. And when found the problem, I’m wondering how in the world it was *ever* working with that bug in it :-(. One success factor of the Arduino platform is the broad availability so-called ‘shields’: hardware plugin-modules which extend the capability of platform. Shieldlist.org currently lists 288 different shields available! Clearly, Freescale wants to benefit from that ecosystem with the Freedom FRDM-KL25Z board which features Arduino compatible headers. Time to use the Freedom board with an Arduino shield :-). 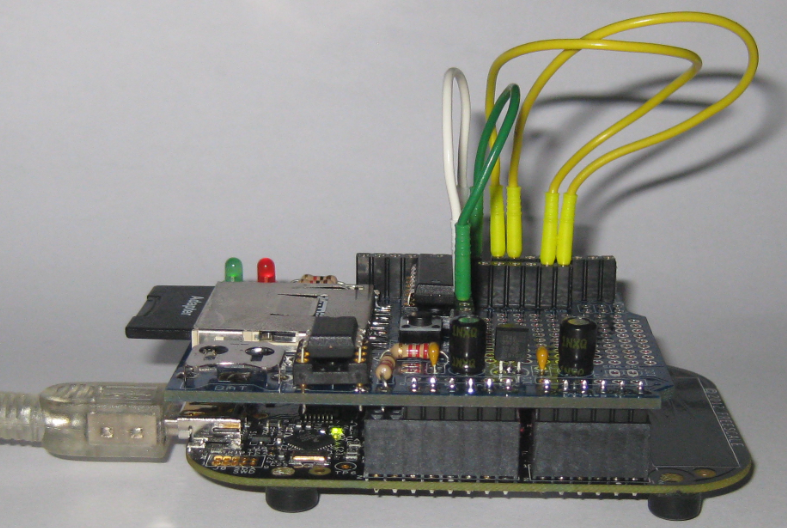 In “A Shell for the Freedom KL25Z Board” I have presented an application which implements FreeRTOS, LED’s and a shell using the UART on the KL25Z over OpenSDA. 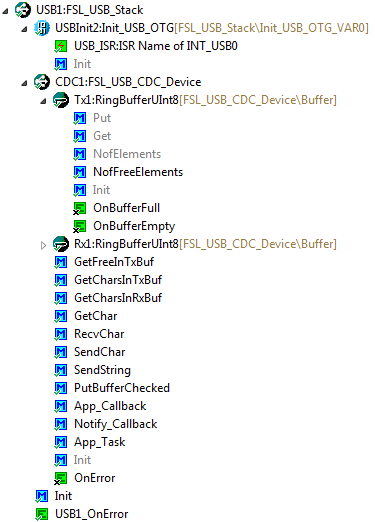 So why not adding native USB CDC to the mix? 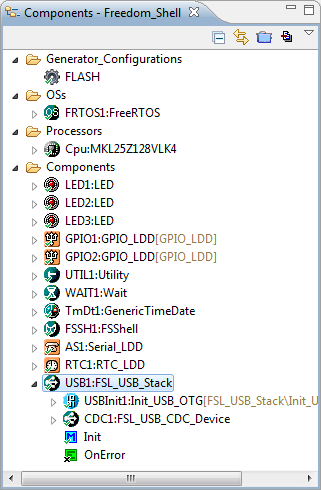 Using both the USB and CDC with the same shell? Sometimes it is necessary to write an interrupt service routine in assembly language. 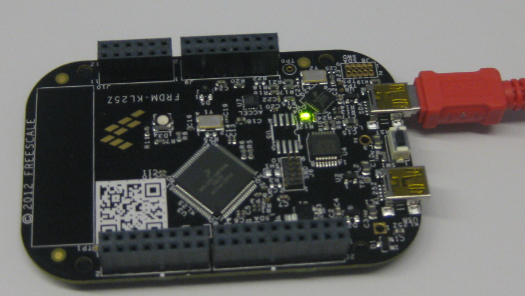 This is the case as well for the ARM Cortex-M0+ which is found in the KL25Z on my Freedom board. But there is something important about the ARM Cortex architecture: Thumb Mode. Thumb mode the ‘ARM way’ to reduce the code size with a reduced (16bit wide) instruction set. The ARM architecture can implement a ‘mixed’ mode, on a function level. 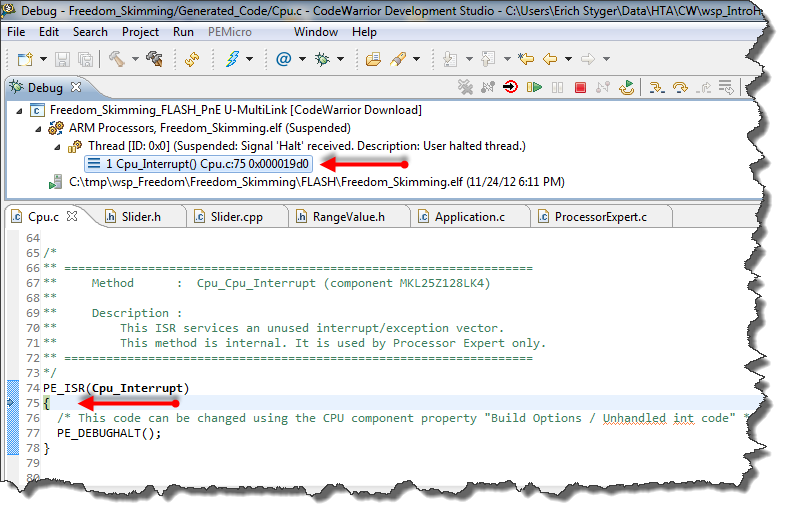 To distinguish between ‘normal’ ARM functions and ‘thumb’ functions, the processor is checking if the LSB (Least Significant Bit) of a function pointer (or function call destination) is set. So a jump address of 0x410 is for a ‘normal’ function, while a function jump to the address 0x411 (even if the function is located at the address 0x410) denotes a ‘thumb’ function. In “Optimizing the Kinetis gcc Startup” I stripped down the fat of my startup code. Now time to add some useful things. 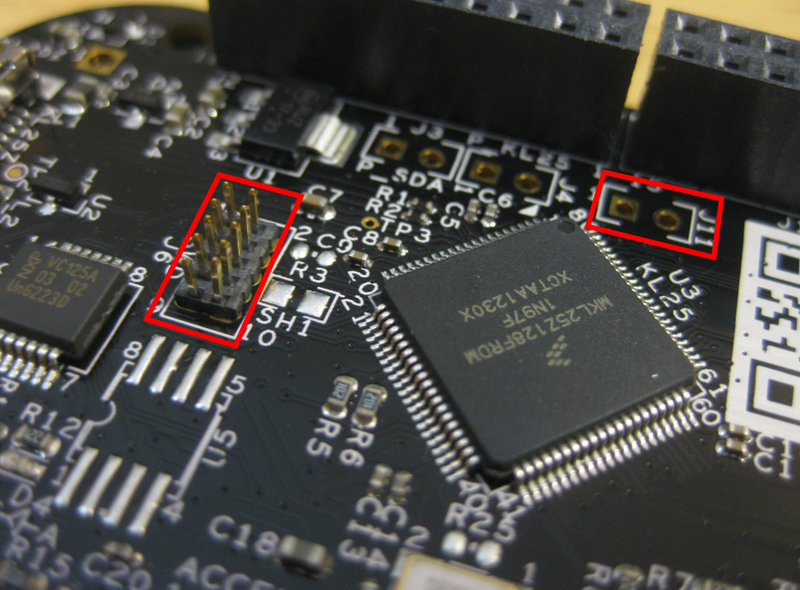 And what does a microcontroller like the KL25Z on the Freedom FRDM-KL25Z board have: Pins! And this means I have bits to set and read :-). That might be an obvious thing for me, but recent questions of readers of my blog let me think that it is not that obvious: How to use a Processor Expert component? How to find example code? But wait! 2604 bytes of code for almost doing nothing? That’s not what I want! There are ways to get that puppy much, much slimmer. Down to 284 bytes . The OpenSDA on the FRDM-KL25Z board is a cool feature: I do not need any external debugging device to program and debug my board :-). But my KL25Z custom board will not have that OpenSDA on it: first because it would add additional costs, and I do not see a way how I could use it for my board, see this forum discussion. I better start using a SWD/JTAG debugger for my Freedom board to have everything in place. There are several reports in the forums around having ‘secured’ the Freedom board. But what does ‘securing’ a board mean? And what does it mean if I get that ‘Device is Secure’ dialog? Device is Secure. Erase to unsecure? This is very useful (and needed) e.g. if the hardware (like USB) needs a buffer at given address. The advantage of the above (non-ANSI and thus not portable) syntax is that I can define a variable at an absolute address, without the need to allocate it in the linker. I wanted to do something similar with gcc for Kinetis/ARM, and searched many forums on the internet. Obviously, I’m not alone with this question. The solution I have found comes close to what I use e.g. for the S08 compiler.